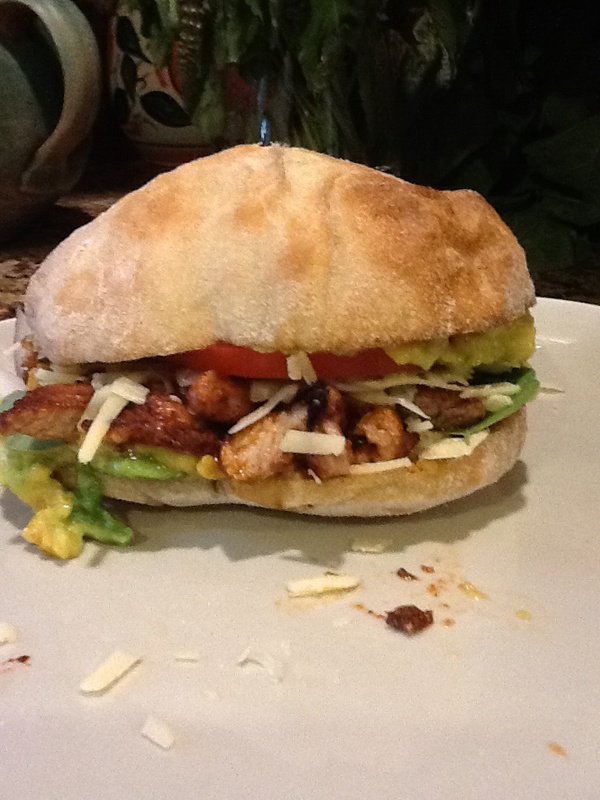 Since we had papalo in this week’s CSA I wanted to try a cemita. When I was investigating papalo a few weeks ago, cemitas seemed to come up again and again as the quintessential way to use the herb. Cemita seems to refer to the sesame roll and to the sandwich and there also seem to all kinds of recipes for the sandwich. This is the one I used tonight. The Guajillo peppers that I got from Penzeys were a revelation. So smoky and fruity. They really made the pork. Papalo really works in this sandwich. Its citrus and medicinal brightness really lift the sandwich. I also could not find good sesame seed buns, but the ciabatta rolls I found at Olde Hearth Bread Company worked really well. This is going to sound crazy but the biggest revelation was the avocado. I love The big Florida (Mexican) avocados. They have a far lower fat content than the Haas. The recipe instructs you to mash the avocado in the shell. Why had I never thought of this before? Genius! No washing up, no mess.